The Keynesian perspective focuses on aggregate demand. The idea is simple: firms produce output only if they expect it to sell. Thus, while the availability of the factors of production determines a nation’s potential GDP, the amount of goods and services actually being produced and sold, i.e. real GDP, depends on how much demand exists across the economy. Suppose GDP is less than potential. Then changes in aggregate demand translate directly into changes in GDP, with no change in the price level. In short, real GDP is determined only by aggregate demand, not aggregate supply. Watch this video for an overview and introduction to Keynesian economics. We will explore the specifics from the video in more detail in this and subsequent modules. The importance of aggregate demand is illustrated in Figure 1, which shows a pure Keynesian AD-AS model. 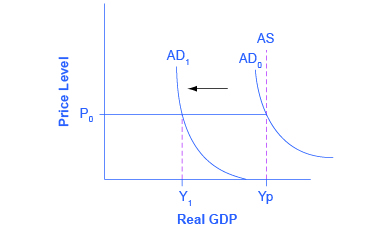 The aggregate supply curve (AS) is horizontal at GDP levels less than potential, and vertical once Yp is reached. Thus, when beginning from potential output, any decrease in AD affects only output, but not prices; any increase in AD affects only prices, not output. Keynes argued, for reasons we explain shortly, that aggregate demand is not stable—that it can change unexpectedly. Suppose the economy starts where AD intersects AS at P0 and Yp. Because Yp is potential output, the economy is at full employment. Because AD is volatile, it can easily fall. Thus, even if we start at Yp, if AD falls, then we find ourselves in what Keynes termed a recessionary gap. The economy is in equilibrium but with less than full employment, as shown at Y1 in the Figure 1. Keynes believed that the economy would tend to stay in a recessionary gap, with its attendant unemployment for a significant period of time. In the same way (though not shown in the figure), if AD increases, the economy could experience an inflationary gap, where demand is attempting to push the economy past potential output. As a consequence, the economy experiences inflation. The key policy implication for either situation is that government needs to step in and fill the gap, increasing spending during recessions and decreasing spending during booms to return aggregate demand to match potential output. Recall from previous reading in the module on aggregate demand and aggregate supply that aggregate demand is total spending, economy-wide, on domestic goods and services. (Aggregate demand (AD) is actually what economists call total planned expenditure, which you’ll learn more about soon). You may also remember that aggregate demand is the sum of four components: consumption expenditure, investment expenditure, government spending, and spending on net exports (exports minus imports). In the following sections, we will examine each component through the Keynesian perspective. Consumption expenditure is spending by households and individuals on durable goods, nondurable goods, and services. Durable goods are things that last and provide value over time, such as automobiles. Nondurable goods are things like groceries—once you consume them, they are gone. Recall from previous readings that services are intangible things consumers buy, like healthcare or entertainment. Disposable income: For most people, the single most powerful determinant of how much they consume is their take-home pay, that is, how much income they earn after taxes, also known as disposable income. Expected future income: Consumer expectations about future income also are important in determining consumption. If consumers feel optimistic about the future, they are more likely to spend and increase overall aggregate demand. News of recession and troubles in the economy will make them pull back on consumption. Wealth or credit: When households experience a rise in wealth, they may be willing to consume a higher share of their income and to save less. When the U.S. stock market rose dramatically in the late 1990s, for example, U.S. rates of spending increased, probably in part because people felt that their wealth had increased and there was less need to save. How do people spend beyond their income, when they perceive their wealth increasing? The answer is borrowing. On the other side, when the U.S. stock market declined about 40% from March 2008 to March 2009, people felt far greater uncertainty about their economic future, so rates of saving increased while consumption declined. Finally, Keynes noted that a variety of other factors combine to determine how much people save and spend. If household preferences about saving shift in a way that encourages consumption rather than saving, then AD will shift out to the right. Spending on new capital goods is called investment expenditure. Investment falls into four categories: producer’s durable equipment and software, nonresidential structures (such as factories, offices, and retail locations), changes in inventories, and residential structures (such as single-family homes, townhouses, and apartment buildings). The first three types of investment are conducted by businesses, while the last is conducted by households. Keynes’s treatment of investment focuses on the key role of expectations about the future in influencing business decisions. When a business decides to make an investment in physical assets, like plants or equipment, or in intangible assets, like skills or a research and development project, that firm considers both the expected benefits of the investment (expectations of future profits) and the costs of the investment (interest rates). Expectations of future profits: The clearest driver of the benefits of an investment is expectations for future profits. When an economy is expected to grow, businesses perceive a growing market for their products. Their higher degree of business confidence will encourage new investment. For example, in the second half of the 1990s, U.S. investment levels surged from 18% of GDP in 1994 to 21% in 2000. However, when a recession started in 2001, U.S. investment levels quickly sank back to 18% of GDP by 2002. Interest rates also play a significant role in determining how much investment a firm will make. Just as individuals need to borrow money to purchase homes, so businesses need financing when they purchase big ticket items. The cost of investment thus includes the interest rate. Even if the firm has the funds, the interest rate measures the opportunity cost of purchasing business capital. Lower interest rates stimulate investment spending and higher interest rates reduce it. Many factors can affect the expected profitability on investment. For example, if the price of energy declines, then investments that use energy as an input will yield higher profits. If government offers special incentives for investment (for example, through the tax code), then investment will look more attractive; conversely, if government removes special investment incentives from the tax code, or increases other business taxes, then investment will look less attractive. As Keynes noted, business investment is the most variable of all the components of aggregate demand. The third component of aggregate demand is spending by federal, state, and local governments. Although the United States is usually thought of as a market economy, government still plays a significant role in the economy. Government provides important public services such as national defense, transportation infrastructure, and education. Keynes recognized that the government budget offered a powerful tool for influencing aggregate demand. Not only could AD be stimulated by more government spending (or reduced by less government spending), but consumption and investment spending could be influenced by lowering or raising tax rates. Indeed, Keynes concluded that during extreme times like deep recessions, only the government had the power and resources to move aggregate demand. Recall that exports are products produced domestically and sold abroad while imports are products produced abroad but purchased domestically. Since aggregate demand is defined as spending on domestic goods and services, export expenditures add to AD, while import expenditures subtract from AD. Two sets of factors can cause shifts in export and import demand: changes in relative growth rates between countries and changes in relative prices between countries. The level of demand for a nation’s exports tends to be most heavily affected by what is happening in the economies of the countries that would be purchasing those exports. For example, if major importers of American-made products like Canada, Japan, and Germany have recessions, exports of U.S. products to those countries are likely to decline. Conversely, the quantity of a nation’s imports is directly affected by the level of income in the domestic economy: more income will bring a higher level of imports. Exports and imports can also be affected by relative prices of goods in domestic and international markets. If U.S. goods are relatively cheaper compared with goods made in other places, perhaps because a group of U.S. producers has mastered certain productivity breakthroughs, then U.S. exports are likely to rise. If U.S. goods become relatively more expensive, perhaps because a change in the exchange rate between the U.S. dollar and other currencies has pushed up the price of inputs to production in the United States, then exports from U.S. producers are likely to decline. This table summarizes the reasons given here for changes in aggregate demand.